Tuesday, May 14, 2019 Suffolk County Apply here! *Please Be Advised Application to the TTT program does not guarantee registration. Registration is limited to 30 participants, all applicants will be contacted. A maximum of one (1) participant per organization will be selected to attend. Preference will be given to those applicants with previous facilitation experience, and those who work regularly with under-served populations within their professional roles. Are you looking to inspire culture change within your organization? Is the community you serve growing in cultural and linguistic diversity? Would you like to be recognized as a trailblazer in advancing cultural and linguistic competence? We have cost-effective solutions for your community-serving organization! "The ideas people have about health, the languages they use, the health literacy skills they have, and the contexts in which they communicate about health reflect their cultures. Organizations can increase communication effectiveness when they recognize and bridge cultural differences that may contribute to miscommunication." A region-specific curriculum for a self-sustaining Cultural Competency and Health Literacy training was developed, by Martine Hackett, Ph.D. Assistant Professor, Public and Community Health Programs, Hofstra University and the National Center for Suburban Studies, Suburban Health Equity Institute. Dr. Hackett's expertise encompasses culturally competent and health literate strategies, maternal-child health, infant mortality, health communications, and health disparities. Her vast experience working with community organizations is a testament to the quality of the cultural competency programs. To advance cultural and linguistic competence, promote effective communication to eliminate health disparities, and enhance patient outcomes. Based on the same region-specific curriculum, there are two kinds of CCHL trainings your organization can participate in. a "Master Facilitator" staff member. After the initial training, certified Master Facilitators are able to lead an unlimited number of 1.5-hour internal staff trainings OR 7.5-hour Train-the-Trainer sessions. This provides organizations with the flexibility to develop and sustain a comprehensive plan for training all internal staff members on the value of CCHL. What is the Virtual Training? This 90-minute virtual training is designed for organizations looking for a flexible option to conduct CCHL staff trainings. Every organization is unique, with varied staff sizes, space, resources, and needs. Which is why this adaptable training may be the right option for your team. Virtual trainings take place on set dates via Webex, with curriculum expert Dr. Martine Hackett leading each session. During these interactive trainings, participants are able to respond to live polls, pose questions, and share feedback about the program. With this training, you can invite your entire staff to participate together during a lunch break. We will ask you for the names of everyone who attended the session to capture attendance. Does your organization keep track of annual updates or staff trainings through a Learning Management System (LMS)? Are you interested in uploading a training video to your LMS platform? If so, click here. Martine Hackett, Ph.D. Assistant Professor, Public and Community Health Programs, Hofstra University and the National Center for Suburban Studies, Suburban Health Equity Institute. Dr. Hackett's expertise encompasses culturally competent and health literate strategies, maternal-child health, infant mortality, health communications, and health disparities. 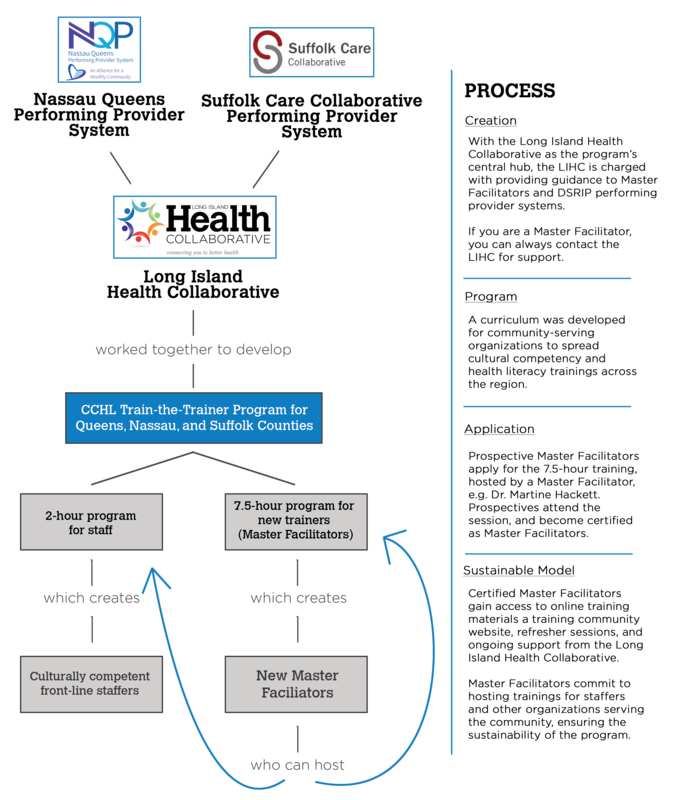 What is the Train-the-Trainer (TTT) Program? Train-the-Trainer is the self-sustaining model of both teaching the CCHL material, as well as teaching how to teach it. During this FREE training, participants will acquire a cultural competency and health literacy toolkit, access to didactic presentations, valuable resources that can be used to activate culture change within their organizations, and the skill-set needed to lead the two variations of CCHL training sessions. The structure of the sustainable teaching system is mapped out below. Click to enlarge. Professionals from community-facing, human service organizations in Queens, Nassau, and Suffolk counties. These participants will become facilitators, capable of leading their own Cultural Competency and Health Literacy Trainings either within their organizations or for community partners. Participants preferably have experience leading groups, and may draw from a variety of professions, including community advocates, health educators, social workers, administrators, clinical professionals, and beyond. To address the health equity needs of targeted demographics, the Long Island Health Collaborative asked for and responded to feedback from members and participants regarding under-served populations in our region. Together with the help of an advisory group and regional experts, the CCHL program offered an LGBTQ health literacy and cultural competency module in winter of 2018 called, LBGTQ Health, an awareness-raising training. This module's curriculum and distribution was influecned by a consortium of LGBTQ regional experts in the field. Read more about LBGTQ Health, an awareness-raising training, and the module's outcomes. The Long Island Health Collaborative (LIHC), funded by the NYS Department of Health as a Population Health Improvement Program, is an extensive group of committed partners who agree to work together to improve the health of Long Islanders. Nassau Queens Performing Provider System (NQP) and the Suffolk Care Collaborative (SCC) are the two entities responsible for implementing New York State's Delivery System Reform Incentive Payment (DSRIP) throughout the Long Island region. DSRIP projects require these organizations to provide cultural competency and health literacy training for their attested partners. The LIHC, NQP, and SCC are working together to ensure that cultural competency and health literacy strategies are in alignment. Working collectively allows these organizations to better serve community members. What is the LIHC's Role? For more information, contact the Long Island Health Collaborative at (631) 257-6957 or info@lihealthcollab.org.